Added new function to Importing & restore database. Use this application as standard data. It may show wrong expectation data. We do not assume any responsibility. This is not for contraception. Easy to use, lauch and enter BBT and weight(body fat), check the items, that's all! 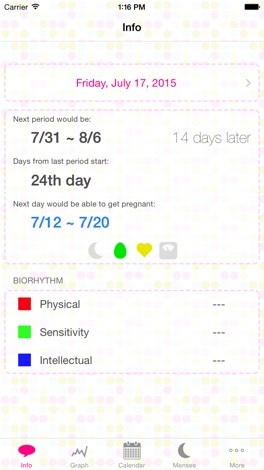 If you don't wanna manage BBT, just check the period, you can see the expectation ovulatory phase, days can get pregnancy and next period days. 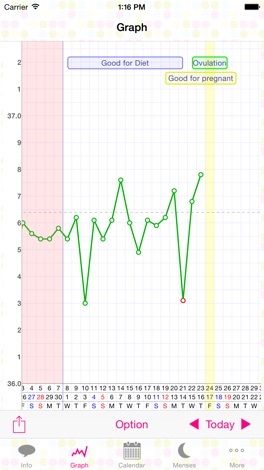 There are BMI calculater and Biorhythm chart as extra function. 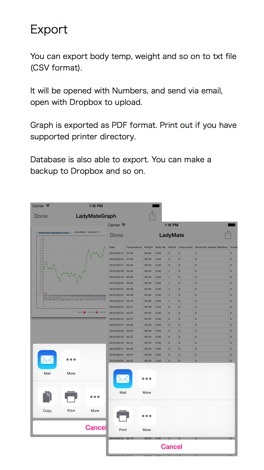 Graph can export as PDF format. 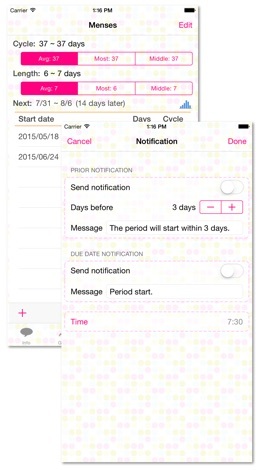 You can send it to other App which can handle PDF. You can send to Dropbox to upload to the cloud. And data can be exported as Text file (CSV format). You can send it to App like Numbers to open it. Database is also exportable to like Dropbox to take a backup.